TCD: Hi Greg & thank you for your time. I grew up on a sheep farm 10kms out of Woodside. Half way between Sale & Yarram on the South Gippsland Highway. Who did you barrack for as a kid? The people who lived on the next farm were huge North Melbourne fans & I just followed them. When I was young they took me to Melbourne to watch my first VFL game. It was at Waverley & I can still remember being awestruck as I walked into the ground. The stadium was huge & the grass looked so green. Did you have a favourite player? Yes, my duffel coat had Steven McCann on it. Funny, the same family took me to watch training at Arden Street. Anyhow we were in the rooms watching the players kick & handball in the rooms before training & a footy slipped through to me & I got to handball it back to Steven McCann. So who did you play your junior football with? About the time I began to play Woodside & Won Wron amalgamated so I played for Won Wron-Woodside in the Alberton League. When I was 16 years old I was playing in the 3rds which was really under 17’s. I then played half a reserves game before being promoted to the seniors. I also played for the inter-league side where I was spotted by Footscray scouts. I was asked to play for Footscray’s country zone against the Footscray metro zone at Narre Warren & then we played the Carlton country zone in Bendigo. I did well enough to be invited to play a game on a permit with the under 19’s. Garry O’Sullivan drove me, my father & another youngster, Michael Atkins to Melbourne where we played Essendon at Windy Hill. So when did you leave Gippsland & come to Melbourne? 1985. The club had set up a house for new recruits in Maidstone. Pre season was absolute torture. I played most of that year in the under 19’s & also played a few reserves games. Obviously times were different to now where it’s full time. Did you work? Yes, I picked up a job as an apprentice fitter machinist at Ralph McKay in Maribyrnong making agricultural machinery. I also tried my hand at landscaping which was the done thing back then, allowing time for footy & an occasional round of golf. When did you make your senior debut? Round 12, 1986 against St.Kilda at Moorabbin. I started on the bench & can still remember my first kick. I probably put my head where I shouldn’t have & got caught too high by Geoff Cunningham. We won convincingly. I think Mick played me for developmental purposes as I was dropped the following week. 1988 was a special year for you wasn’t it? Yes, I kicked my one & only league goal that year. We were playing Geelong down at Kardinia Park & it was a dead set squall with a howling gale & torrential rain. Anyhow I’ve picked the ball up on the half back flank, running off Gary Ablett mind you, baulked Garry Hocking & handballed over to Doug Hawkins & kept running, then got it back, blind turned around Barry Stoneham & threw it on the left foot from about 55 metres out on a tight angle. It never looked like missing. No, I got a free kick & a 50 metre penalty & slotted it from 45 metres out on a clear sunny day. In 1991 you played for Victoria against WA in Perth. How was that experience? Awesome. I couldn’t believe I was in the same team as all these superstars. It was nice to be in the same team as Gary Ablett for a change I can tell you. I got to room with Chris Langford too which was a thrill. Gary Ablett. Didn’t seem to faze you playing on him. Outwardly it might have appeared that way, but it was anything but. At a team meeting Mick told me I would line up on Ablett & I just nodded & said yep, no problems. From then on Mick dubbed me the Iceman. Ablett the best you played on & who else? •	Terry Daniher – I played on him as a youngster & he just ran & ran all day, worked very hard & was a strong mark. •	Peter Daicos – He was a freak, could kick goals from anywhere. The tighter the angle the freakier he got, bouncing them through. Very skillful. •	Robbie Flower – Very skillful & you could never let your guard down. I played on him in his last season & at half time had held him goalless, then after half time he kicked 3 on me as Melbourne won to make the finals in round 22. What about players you played with? •	Michael McLean – Magic was an appropriate nickname for him. He was so skillful & elusive, just seemed to effortlessly step around people. •	Brad Hardie – Like Magic, he just seemed to avoid being tackled. His ability to step & evade a tackle, just super cool. •	Tony McGuinness – A machine, just seemed to break out of the center & had a long penetrating left foot kick. •	Doug Hawkins – Just so skillful, either hand or foot & very strong one on one. •	Rick Kennedy – Perhaps not as skillful, nor as evasive, but he didn’t have to be, he just ran straight through whoever was unlucky enough to be in the way. He was there for a job. You only had the 2 coaches, Michael Malthouse & Terry Wheeler. Chalk & cheese? Yes & no. You would run through a brick wall for both of them. They had the players playing for them. Mick was more defensive, knowing we were likely to kick x number of goals, so to win we had to restrict the opposition, whereas Wheels was more attacking & liked players to take chances. I remember Mick encouraging players to make the most of their opportunities to play league football because it’ll be gone before you know it. Mick always made a point of saying hello to my Dad when he came down from the country. That meant a lot to me. Wheels was big on the team bonding & loved to organize camps & so forth for pre season, including the parachute jump. How did you enjoy that? You mean when I came to? I really enjoyed it. We had spent the previous day doing all the safety training. I jumped out of the plane & began to tilt forward with my eyes closed until the chute opened & then I mentally checked off that all was fine. It was the best feeling imaginable floating down towards the water. Never again though! Firstly under Mick I had been taught to sacrifice my game to cut out one of the opposition's major threats. Wheels preferred his defenders to be much more offensive, so didn’t fit into the team’s style. In round 14 I was selected to play my first & last as it happens, game of the season against Collingwood. I played on Gavin Brown who was up & running then. We lost by a goal. I thought I did OK.
You weren’t the only one either. No, the umpires thought so too & awarded me a Brownlow Medal vote. So that was your last year at the club? Yes, I had actually been re-contracted after the season, but after the first few practice games the club decided to let me go. I spoke with Richmond but nothing eventuated. I then commenced training with North Melbourne under Dennis Pagan. I played the first game of the 1993 season, but injured myself. It was on OP type injury & I just couldn’t overcome it. I played in the reserves & was picked as an emergency a few times, but by then Dennis had them up & firing & I just couldn’t break into the team. I also pulled a hamstring too which didn’t help. At the end of the season I weighed things up & having played just 2 senior games in 2 seasons I decided I’d had enough. I retired at the age of 27. If I’d have had surgery when I first got injured I might have played longer. Did you play elsewhere afterwards? No, I had many offers from country & metro clubs, but I’d just had enough. When I look back & reflect I realise how fast my first 100 games just flew by & what Mick said about it being over before you know it. Even though I retired 16 years ago it still seems like yesterday. What did you then do after footy? I went back & studied & gained a Diploma in Business Programming. I work at Prowess Sports (www.prowess.com.au). We’re into software development, sporting software, statistics systems & video editing systems for all sports. A number of AFL clubs including the Western Bulldogs are clients of our as are clubs in other leagues from VFL, TAC through to the Amateurs as well as some of the NBL basketball teams. So, in layman’s terms, what happens? Let’s use live AFL stats as an example. We have a caller in the box & a number of staff operating 3 computers with ‘custom designed keyboards’. A call like 'Johnson kicks long to advantage' will have the staff keying in that data on the computers, which is then in turn is collated by another computer & sent to laptops in the coaches box. Do you still follow the footy? Yes, aside from the work side of things I have been a Western Bulldogs member for many years. A few years back Mark Hunter was able to pass onto me my #12 locker, which I have at home. No, I have been married to Adrieanne for 10 years & we have 3 girls, Ruby who’s 8 & identical twins, Romi & Zoe who are 6. Finally, any bitter feelings after your final year at the Bulldogs? No, I live in Williamstown & often see Wheels out & about, there’s no hard feelings, we have a laugh & a joke. Greg, thank you so much for your time. 85, 92, 97, 98, 08, 09, 10... Break the curse! TCD your commitment to these interview is much appreciated. Always look forward to them. Thanks Mutley, honestly they are a labour of love. I really enjoy them & today Greg was just fantastic to talk to, a really nice bloke who gave me so much time. Helps too when the players have a good recall on things from days gone by. Well done TCD great get love the icemannever knew mad Mick gave him that name .What a great bloke shame about the 3 girls but happy he is doing well and still follows the red white and blues. Now "Doc" did have one mean mullett. They were popular down South Gippsland way. One of my memories of Greg was when he was giving Ablett an absolute bath at the WO. Ablett got so frustrated with the close checking, he belted Greg in the guts. Greg really had the wood on Ablett. I only have one memory of Eppelstun. Knocking the ball out of bounds. A lot. Surely you have something to add on Eppelstun? I can recall he often would keep Daicos quiet. 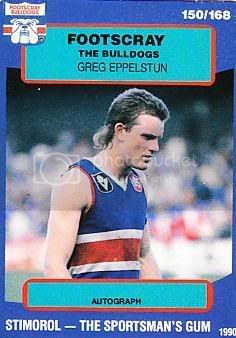 In that famous 1990 game against the pies, Epplestun kept Daicos very quiet only to see the Magician kick to goals within a minute. Still contributed to us winning with Billy kicking that great goal! Just slightly before my time. Good read, sounds like an interesting character, thanks for that TCD. Another player who Malthouse got the best out of. Proberly best I don't make to many comments on Greg. Although we did call him Autumn Leaves. I used to always defend the Iceman- not the greatest of skills but an honest player with a big heart!!! He always looked white as a ghost.....didnt get too much sun Greg!!!! He is a top bloke has time for everyone. Good interview CD.